Are you in the market for a new refrigerant management system? 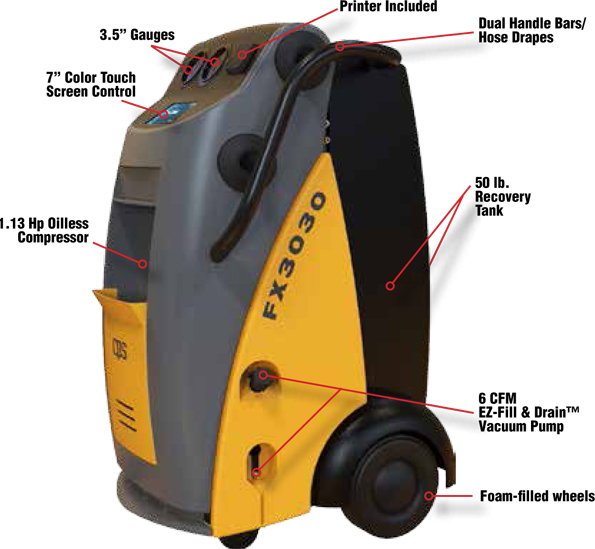 Best Buy Auto Equipment proudly provides the latest in ease and endurance with the CPS FX3030 Advanced Dual Gas Recovery, Recycle, and Recharge machine. CPS Products is a world-leading manufacturer of tools, instruments, and service equipment for automotive air conditioning systems that professional technicians trust above all else. With no shortage of user-friendly features and groundbreaking technology, this refrigeration management center will help you streamline your diagnostic and service time from start to finish. Under the helm of its new FX Series, CPS has applied its vast technological knowledge gained from years in the A/C and refrigeration industry to the CPS FX3030 Advanced Dual Gas Recovery, Recycle, and Recharge machine. The cutting-edge user interface dramatically simplifies operation, so you can quickly access all functions from the main screen, and on-screen instructions eliminate the guesswork every step of the way. Seasonal technician training will soon be a thing of the past! Better yet, this system supports multiple languages and units of measurement. Using motor-controlled ball valves, CPS has managed to significantly improve speed while reducing possible obstructions due to contaminants. With manifold mode, you can print a snapshot of pressures before and after service, which we are sure your customers will appreciate. We offer interest-free financing options for up to six months on the CPS FX3030 Advanced Dual Gas Recovery, Recycle, and Recharge as well as free shipping, so you can improve A/C services without spending a fortune all at once. Please feel free to submit your application today without any obligation to buy. Let us know if you have any questions about this SAE-certified Recovery, Recycle, and Recharge machine. Dimensions H 60" x W 27.5" x D 25"